This is a brand new one from Murray McDavid. 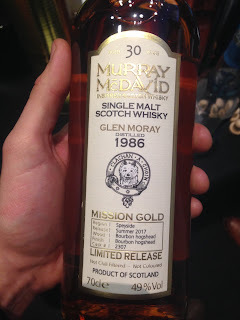 I’ve always wanted to try some older Glen Moray, having not been hugely impressed with the stuff I’d tasted on the tour there but hearing great things about some of the older versions from the independent bottlers. I don’t remember there being anything amazingly special about the distillery itself. Just another Speysider in my book. Well, before this one. Nose: Old and antique. Oak, lots of it, musty orange, leather, old books, new car, cocoa powder, dry, orange peel, orange oil, a nice complex nose. Marzipan! How’d I almost miss that out? Taste: Sweet arrival, orange, chocolate, orange peel, complex florals, complex oak and spice, white pepper, leather and chocolate, liquorice. The florals give this a nice balance from the old, oaky flavours. Love the abv too. Finish: Long length. Oak more intense here, dry, dark chocolate. 30 years old. Lovely old whisky. Similar style to old Balvenie and great for it! Actually, it’s an equal to the Balvenie 30 in my mind. A big accomplishment really.